Introducing CURODONT REPAIR FLUORIDE PLUS, a unique professional anti-cavity rinse for the non-invasive treatment of white spots. With the special CUROLOX formulation and application it acts where it is needed most, deep within the early carious lesion. Strengthening and remineralizing the entire enamel layer, it surpasses conventional fluoride products for anti-cavity treatment by far. “We don’t have to imagine chemistry that literally grows into the tooth, now we have it!” Dr. Brian B. Nový, Director of Clinical Innovation, DentaQuest, Westborough, MA, USA. Available now in the US through our partner Straumann, as a cornerstone in the new Straumann® Preventive Dentistry portfolio. Get in contact and learn more in how to differentiate your practice, increase chair time value and diversify your patient base with this new therapy. Click here and register on Straumann’s dedicated website. CURODONT™ PROTECT shows superiority over fluoride varnish in caries prevention and remineralization of white spots around brackets. 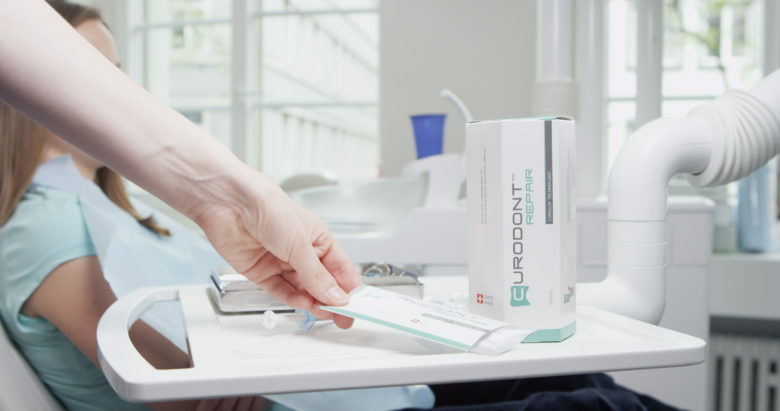 A randomized, placebo and gold-standard controlled clinical trial (RCT), investigating the treatment of incipient buccal caries lesions with CURODONT™ REPAIR was presented at the IADR 2018 in London. 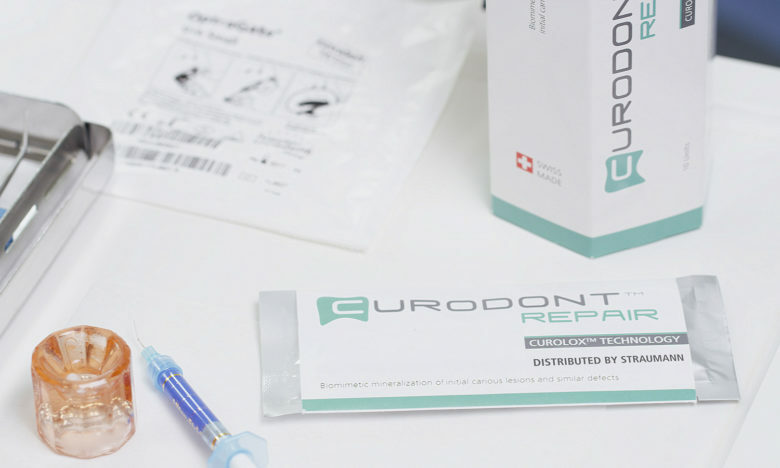 In this study Prof. Krejci and his team at the University of Geneva showed that the use of CURODONT™ REPAIR is superior to that of fluoride varnish (22’600ppm) or a placebo treatment. An additional patent for a “Method for producing a composition for treating a tooth lesion” has now been granted in the US and the EU. With this credentis secures the intellectual property (IP) of the innovative CUROLOX® TECHNOLOGY in its leading caries treatment product CURODONT™ REPAIR for an additional 15 years. In their study “Self-Assembling Peptide Matrix for treatment of dentin hypersensitivity: A randomized controlled clinical trial», Dr. M. Schlee and colleagues compared the ability of the CURODONT™ D’SENZ gel and a professional desensitizing toothpaste containing 8% arginine and calcium carbonate [ACC] to alleviate dentin hypersensitivity (DHS) over a period of 90 days. 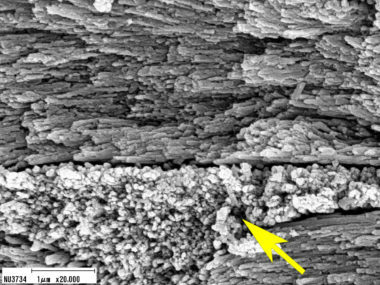 Independent Japanese researcher tested in vitro the ability of CURODONT™ REPAIR not only to protect but also to remineralize artificial eroded enamel. 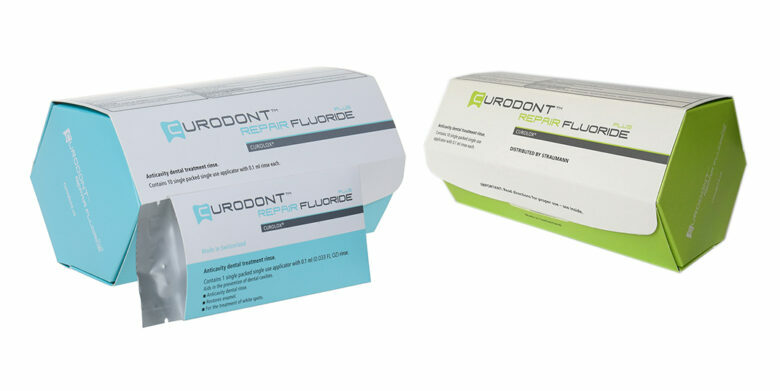 Over 40 scientific publications related to CURODONT™ REPAIR and the CUROLOX® TECHNOLOGY describe the development, function, safety and clinical efficacy of Guided Enamel Regeneration with the self-assembling peptide P11-4.